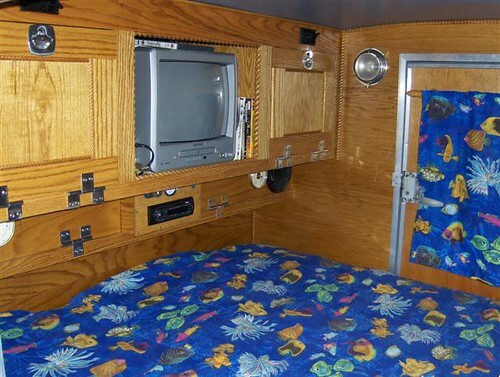 Teardrop RVs, the smallest camping trailers on the road! The smallest camping trailers on the road! So first off... What the heck is a teardrop trailer anyway? 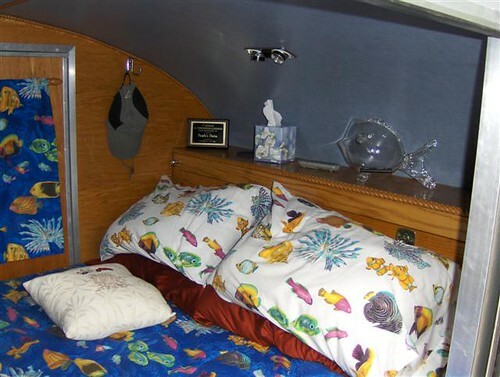 That is Paul Garland's home built teardrop camper. These tiny campers are designed for convenience. With teardrop trailers you can have the comforts of home with the ability to tow with just about any vehicle. This amounts to huge savings in time and money for teardrop trailer owners when comparing to regular camping trailers and motor homes. I know what you're thinking... What are they saving? Purchase costs... A very basic brand new teardrop trailer starts out at around $4000. I've also seen some beautifully built teardrops with lots of features cost as much as $12,000. Home built... Are you handy? Maybe you can build your own with the help of some building plans. 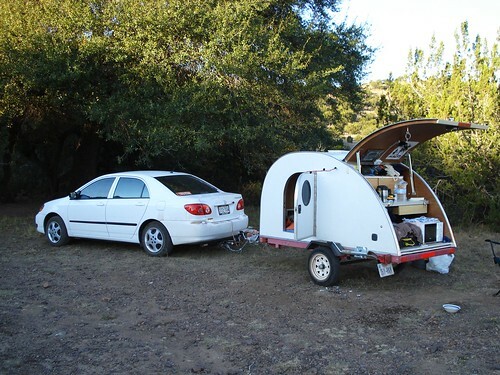 See how Mark and Cindi built their own teardrop trailer. Gasoline... These little trailers can be pulled by 4 cylinder vehicles, some can even be towed by motorcycles! Maintenance... Teardrop trailers have virtually no maintenance when comparing to motor homes and other campers. Not so bad, huh? Much more comfortable than a tent and a sleeping bag, that's for sure. And get this, some people even have A/C in their teardrops. Thank you Travelrmel for sharing these pictures on Flickr. Check out Travlrmel's photos for other cool teardrop sightings. Remember, almost every teardrop is unique! So, are you as fascinated by teardrops as I am? Continue browsing below for some really useful resources and links on teardrop trailers. I built my own teardrop trailer!